The Ibiza first went on sale in the UK in 1985 and this, the latest generation, is the best yet. This is the first Volkswagen Group car based on the MQB A0 platform, which means it should promise much in the way of handling, ride and comfort. There are four five-door-only models on offer: S, SE, FR and a new premium Xcellence. Initially there are three, three-cylinder petrol engines: 74bhp 1.0 MPI, 93PS 1.0 TSI and 113bhp 1.0 TSI. A 148bhp, 1.5 TSI Evo will come later in 2017, but don’t get too excited - Seat says there are no plans for a Cupra. There’s a choice of five-speed manual transmission on 74bhp and 93bhp versions, and six-speed on the 113bhp and forthcoming 148bhp Evo versions. A DSG auto is available on the 113bhp FR. There will also be 83bhp and 93bhp 1.6 TDI diesels available later. The naturally aspirated 74bhp, 1.0 MPI engine is available in S, SE and Xcellence trim levels and, although the combined fuel consumption is slightly worse than the 93bhp TSI turbo engine at 57.6mpg compared with 60.1mpg, choosing the least powerful engine drops the insurance group from to 5E from 11E for the S and SE and from 12E to 6E on the Xcellence. Wheel sizes range from 15-inch on the S and SE to 16-inch on the Xcellence and a striking 17-inch design for the FR. Inside, S models comes with basic black-and-white 5.0-inch touchscreens but the SE upgrades to colour. FR and Xcellence models get 8.0-inch colour touchscreens including voice recognition and sat-nav as standard as well as apps such as Apple CarPlay and Android Auto. The same set-up is an option on the SE. 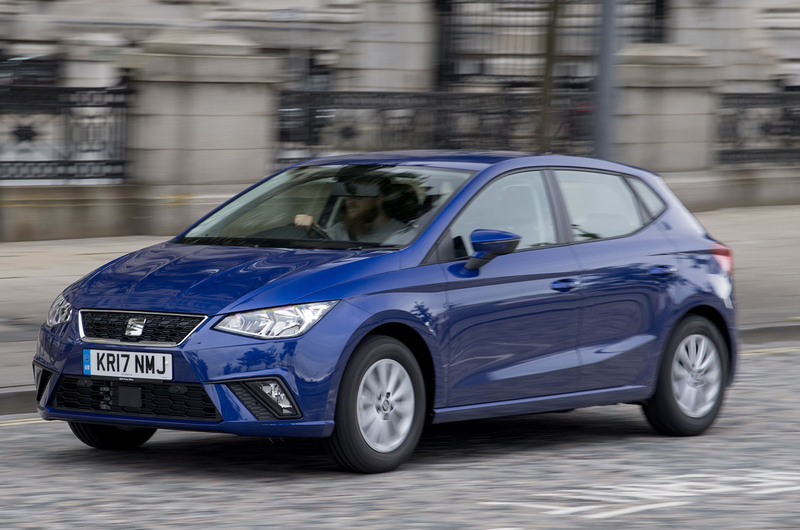 Beauty may be in the eye of the beholder but it is probably safe to say the new Ibiza is a pretty little car with great proportions and striking looks from almost any angle. Inside, it is the same story with quadrilateral shapes carried across features such as door handles, air vents and door mirrors to create a slick, harmonious feel throughout the cabin. The dash is clean and classy despite the use of inexpensive-looking surface materials and touchscreens are smoothly integrated at its centre. Instruments are crisp and expensive-looking, giving a premium feel to the cabin. It’s generally a fun place to be and spacious too, with plenty of room for six-footers to sit one behind the other and a usefully shaped 355-litre boot, which is 63 litres bigger than that of the outgoing model. The naturally aspirated 74bhp, 1.0 MPI engine tested here in SE spec is predictably sluggish in a car weighing a tad over a tonne. Accelerating requires patience and overtaking manoeuvres a deal of strategic planning but, once it is up to speed, it will cruise at 70mph without any fuss. The gearbox is pleasingly light-shifting and the brakes are not over-sensitive with a good feel. The steering is less responsive and feels slightly less agile than the benchmark Fiesta in that crucial moment the wheel is moved away from the straight-ahead and, in that sense, it doesn’t convey the same sense of excitement. Because of that, the Ibiza may be missing a trick in that sometimes subliminal connection a car makes with a driver, but it doesn’t detract from the fact that it is supremely poised with a good ride, decent body control and no vices. 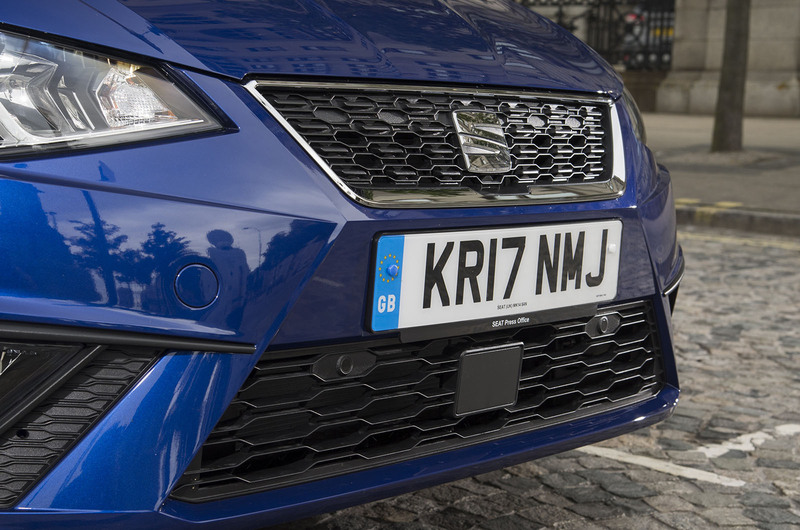 Seat has put a lot of effort into the new Ibiza and it shows. 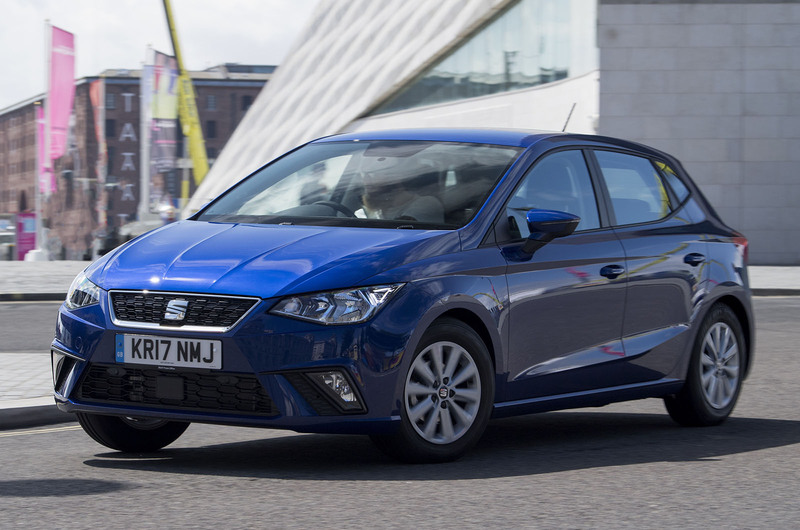 It’s a properly grown-up supermini with enormous appeal, a good range of safety equipment and an attractive options list including a Beats sound system. Unless you are shooting for the lowest price or insurance group, the 93bhp engine is probably a better choice at £14,595 in SE trim; the torque and flexibility of the turbo adds far more to the performance than a 19bhp difference in power suggests. Make that choice and you’ll buy into a five-star package that has no real faults and a lot to like. Prices range from £13,130 for the Ibiza S 74bhp 1.0 MPI to £17,310 for the 93bhp 1.0 TSI Xcellence. Seat’s mission statement for the new Ibiza is a bold one. It aims to create the best small car in Europe. That’s a tough call when faced with the likes of the new improved Ford Fiesta - so can it really live up to the boast? This looks to be a competitive package and a bit more interesting than a Polo or Fabia. But 1091kg suggests that the SEAT is on the porky side. Or is it? The quoted weight includes the driver, so just how heavy is he or she? I daresay that the figure is taken from EU homologation data (which probably also includes a tankful of fuel?) and is the only figure available, but is it fair to compare this with the 1000kg or thereabouts weight quoted for the Suzuki Swift for example? I know this is only a "first drive" but I for one would like to see more accurate and consistent figures quoted for something as important as vehicle weight. Maybe a true figure will be revealed in Terminalsecurity's full road test. Knocking on the door of 15 seconds to hit 60 is bordering on punishment and then there's the looks i.e. a Leon but reduced in every direction by 15%, so will therefore look dated in just a couple of years. £14,000-overpriced, for the same money you could have a Baleno SZ-T with a 1.0 turbo 111bhp, NAV, Cameras, auto lights, privacy glass, HID. Will probably be more reliably too. 4.5 Stars? You having a Turkish? I'm sure the more powerful Ibiza's deserve the 4.5 star score but come on; is it really worth tat many when it's powered by such a wheezy engine and weighs 1.1 tonees? Other makes receive a score based on each individual vehicle driven and not across the board. Sorry about the spelling! Replace tat with that and tonees with tonnes! Apostrophes shouldn't be used in plurals either I.e. Ibizas, not Ibiza's. If your only needing a commuter Car then in this form it's ideal, my Wife drives 16'plate 1.2 (110bhp) FR, it's quiet ,fast enough when needed,is good on Fuel mpg and handles pretty good too,having seen the new Car all I can say is like other brands they've filled it with the tech so it appeals to younger People what's considered essential a must have not to improve the performance of the Car more to keep the owner in constant with whoever. If Vauxhall can churn out a large estate that can carry five and their luggage, crack 60 in under 9 seconds and comes loaded with kit for under £20k, why is a 1.0 litre Ibiza £14k? A shame really, becuase it sounds like a very good car albeit providing you chose a TSI engine. IF YOUR WANTING AN ESTATE,but, if your wanting a nippy little town Car that has low running costs and so on,your not going to want an estate just because you get more for your money are you?